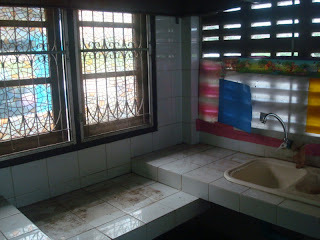 A little while back I promised you an update on how the renovations of our house in Chiang Mai were progressing. The property was purchased in October last year, but we were unable to visit it until August this year, so it was in need of some serious TLC. Rather than bore you with a long post about mixing cement and choosing paint colours......it's easier if I show you some before and after pictures. I'm glad to say that it's now fit for human habitation and as the drill sergeant in Full Metal Jacket remarked.....it's now so sanitary and squared-away that the Virgin Mary herself would be proud to go in my bathroom and take a dump!!! !